One of several Schucos that I have in varying conditions is this red Grand Prix Racer, code 1070. These came out in the 1940s I believe, and continue in production even now. This one I found as an incomplete toy, but complete with its clockwork motor and axles. Over time I have been looking for parts to make this toy, originally built in the 'US Zone Germany' after WW2, totally complete. I am still missing one mirror and the fuel filler cap, but I'll find one in a toy fair sooner or later. 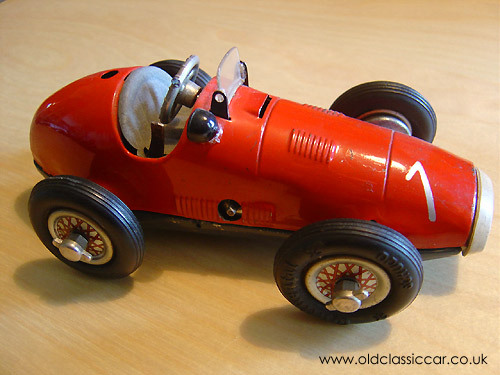 These models are great display items, and are styled around the typical Grand Prix type cars of the 1930s and 1940s. They came as a kit of parts that you had to assemble yourself, this goes some way in explaining why so many Schuco toys that you find today are missing the odd parts, usually the plastic grille or a wheel or two! Also see the Schuco 1050 Studio racer based on a pre-war Mercedes Benz, and this later Schuco model of the 1974 Mclaren M23 Grand Prix car. A car that appears to be based on a pre-war Tatra, the Schuco 1750, may also be found here. Colour: red, black base, no driver.